Also check out: “Singly reinforced Sections” article series. Now, our next step would be to study different methods for calculating moment of resistance (MR). The moment of resistance is calculated by taking the moments of forces about the centre of gravity of the tensile steel. Where, (1.5m – 1)Asc is the equivalent concrete area of compression steel. σcbc is the compressive stress in the concrete at a depth d’ mm from the top of the beam, where Asc is provided. 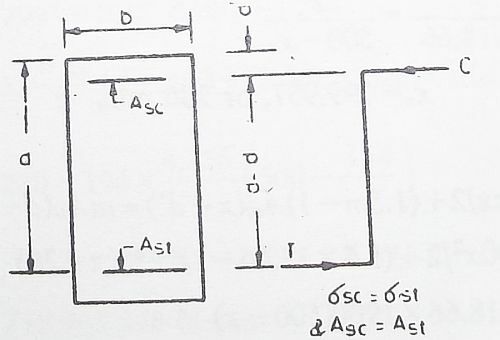 The moment of resistance can be calculated using this method. The calculations are approximate and not very accurate. The whole concrete is neglected. Asc and Ast are taken into consideration for the calculations purpose. Permissible stresses in tensile and compressive steel are the same.